We could not have chosen a hotel that was better located in Rangoon, about 30 minutes from the airport. 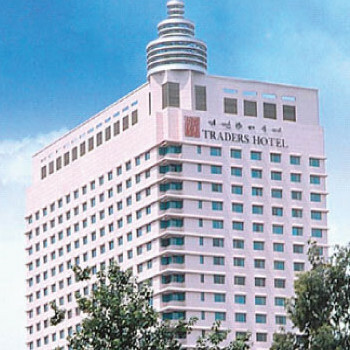 A few hundred yards from Bogyoke (Scott) Market and from Sule Pagoda, this hotel is within easy walking distance of the hustle and bustle of colonial Rangoon. The hotel has 242 rooms, including Club rooms, with a full range of amenities including tea / coffee making facilities and complementary (although slowish) broadband access. As we arrived late on the first night and departed early on the final day we opted for a non-club Delux room, which was well appointed and decorated – a first class room. It should be noted that extensive refurbishment of this hotel was and still is taking place and is expected to extend well into 2013. At the time of our visit, this included the pool, area and restaurants but these were due to be completed before the end of 2012. Traders Cafe, a buffet and a-la-carte 24hr restaurant serving local, international, Indian and Asian dishes, where breakfast is taken was being renovated during our visit. Nevertheless the food and service were very good. There is also a signature Chinese restaurant, The Summer Palace, where authentic Chinese food can be obtained – the dim sum and other dishes were delicious. Additionally 24 hour room service is available. The Gallery Bar was well appointed with excellent service and the Lobby Lounge was excellent for drinks, light snacks and internet access in comfortable surroundings. The hotel is air conditioned throughout – a very welcome feature! Service at this hotel, which is part of the Shangri-La group, was attentive, helpful and efficient and always delivered with a friendly smile – we could not fault in any way. It should be noted that this is an upmarket business, rather than “resort” hotel and therefore the lobby area can get busy, particularly during the daytime. Service, however, was well geared up to this role and we never had to wait for any unduly lengthy periods. Should we return to Rangoon, we will undoubtedly return to the Traders hotel.